I have had a long and varied passion for sport, conditioning and physical activity. From playing basketball at a competitive level in my youth to coaching it and training Capoeira, Olympic Weightlifting, to completing a Sports Science degree and beginning a PhD in Sports Science, to organising basketball camps and tournaments in the UK and Poland – to offering Personal Training today, this passion continues …. As an athlete, I experienced various methods of training and gained valuable insights from my coaches and trainers. As a Sports Science graduate and former part-time lecturer on the Sports Science degree, I am able to distinguish between catchy fashionable fitness trends and no-nonsense effective training and nutrition approaches. I also stay updated with latest research findings in a rapidly developing field, by regularly attending courses and conferences. Complementing my experience as an athlete and academic background is my practical training including Advanced Personal Training, and further practice with top Weightlifting Coaches and Kettlebell experts. I closely cooperate with physiotherapists, nutritionists and exercise physiologists giving me valuable contacts if expertise is required that is beyond my specialisation. This combination of sound theoretical knowledge, practical skills and personal experience working in sports and gym settings with clients of varied abilities and goals has given me an in-depth understanding of training principles and enables me to create effective training sessions and long term plans to help you achieve your personal goals quickly. A passion for enhancing sports performance and improving health and well-being and the satisfaction of helping others to achieve these goals has driven to become a Trainer. I find it even more rewarding to help you overcome unusual challenges and obstacles, whether your goal is to look good, perform better or stay fit. My approach is results driven, engaging, systematic and sensitive to individual needs and requirements. My training specialities include functional strength and sports conditioning, Olympic Weightlifting, Suspension Training (Gymnastic Rings/TRX), corrective training and injury prevention nutrition and body composition management (toning up, fat loss, muscle building). I use variety of equipment, training styles and methods to maximise your results. I offer a flexible approach with 30 minute or 1 hour sessions to suit your needs and availability. In addition I offer not only PT sessions, but also training programmes reviews and consultations, exercise technique evaluation and advice, Flexibility and Muscle relaxation sessions, nutritional advice. "Direction is more important than speed. Many people are going nowhere fast." I was always a keen runner which helped keep the weight off. I did, however, want another challenge as I approached my mid 30s. I spoke with and indeed tried a few PT’s and then had the pleasure of meeting Tom. He kept it challenging, fresh, different and he made me do things I thought I couldn’t! I can squat, lift weights above my head, use kettle bells, do more than 1 pull up! This is all because he believed in my and told me to keep pushing on when giving up would have been the easier option. Tom also has great knowledge of bio mechanics so I can ask him ‘why are we doing this’ and ‘how does this effect this’. Its made me learn more about my body and how it all links together. I actually look forward to leaving work now and going to my PT session as there is always so much to do and even though it is bought at the time I feel fantastic afterwards. I contacted Tom to help me train for a trekking holiday in Patagonia. He researched exactly what would be required of me whilst I was out there and responded by devising a complete training programme. It encompassed everything I would need to be completely primed and ready for the challenges ahead. I was astonished with what Tom helped me accomplish and I have since continued to use his expertise to further improve my fitness and health. Full of advice, knowledge, encouragement, drive and good humour, I cannot recommended Tom highly enough. John D.
I feel extremely thankful to have had the absolute privilege of working with Tom on both strength and conditioning for the past year. As somebody who has worked out for years but has always stayed away from the services of a personal trainer, as my first trainer, Tom has exceeded and surpassed my expectations with his professionalism, creativity, understanding, encouragement, knowledge and preparation. His innovative workout plans keep the results coming while pushing me to my limits. Even when we are not in a scheduled visit, Tom willingly makes himself available for any questions that I may have. He is well liked and respected by both his peers and his colleagues. Tom has repeatedly shown that he possesses the attributes required to make an outstanding personal trainer and motivator. He has made the transition into working with a personal trainer an easy and enjoyable one, while providing me with tips and guidelines to remember in the future. I would recommend Tom’s services for anybody who was like me and needed a change from a routine that lacked in creativity and consistency. I am positive that within a short time with Tom, results with show and the desire to return to the gym on a daily basis will flourish. I have been training with Tom since August 2011 and have made great progress. As an office worker and ex-ballet dancer, with some long-standing injuries, I have some unique training needs. Tom took the time to understand my history and goals and has developed a flexible programme for me. I am now doing some exercises that I would have not thought possible due to my injuries. My sessions change regularly, with Tom constantly challenging me and using his expertise to develop sessions that push me to my limits, while working to manage and improve my injuries. 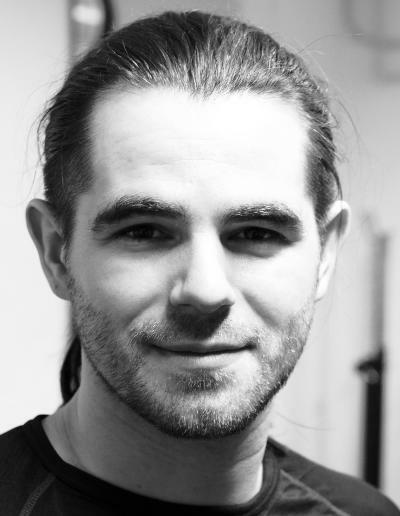 Tom is an exceptional personal trainer, with a very unique set of skills, expertise and devotion for his clients. I’ve achieved more in the past 5 weeks exercising with Tom than I’ve ever achieved working very hard on my own. Tom was able to challenge and accommodate my training and develop a routine that has helped me tone. I amazingly strengthened my posture and shoulder, which have been my biggest challenge over the years. He has provided advice and references on how to make a balanced diet as well, which made me achieve my goals to slim down as well. I highly recommend training with Tom! I have been member of several gyms over the years with little to none result. I have always been concerned about weight lifting and how to deal with it as I suffer with a minor back injury. Tom’s knowledge of sport medicine has managed to increase and strengthen my muscles within few months of training together. His expertise and dedication has helped me to reach beyond my perceived limits, and more importantly maintained these benefits through his professional nutritional advice and a personalised realistic fitness program. He has brought the fun element back to my training session changing and updating my exercise regularly. I would recommend him to anyone who wants to see real changes in their body shape and feel great about themselves. I began training with Tom to improve my fitness and conditioning for Rugby. He formulated a programme specifically for my requirements and I have seen good results since the start. Training with Tom has been enjoyable and rewarding – I would highly recommend him. The first thing that attracted me to Tom was his relaxed and friendly approach to most people at the gym. After as we started to chat I was quite impressed by his approach to weight training which seemed grounded in a scientific approach as compared to other trainers which I have seen. I had been training for about 20 years and so didn’t really feel I needed a personal trainer. I like how my body looked but there were some problem areas which I didn’t feel like I was making much progress on. In addition, my workout was beginning to feel a bit boring and uninspiring. When I spoke to Tom I told him I didn’t want the same approach I had seen with other trainers who seem to push without any understanding of the person they were training. My sessions were a revelation. He was patient with his new radical programme and pushed when he felt it would be helpful but backed off when he saw there was resistance from me. The programme was challenging and I began to look forward to working out again. I finally felt confident that what I was doing was not just pushing weights around but training the right muscles in the most effective way. Over 3 months, I began to see the difference. The body fat that I wanted to reduce started being reduced and I was gaining in muscle mass. Also my blood pressure which was high overtime began to return to normal. I would recommend Tom if you want a sustained and focus approach to weight training and body sculpturing. If you are not looking for gimmicks but want a programme that is grounded in a scientific approach then Tom’s your man. Plus the session are also interesting since Tom is more than a typical Personal Trainer… in a way he is a coach too so you get insights into nutrition and lifestyle changes plus the conversations in the rest period can go from philosophy to weightlifting to the new scientific reports on the physiology on muscle movement. So in short you get allot more for your money when you train with Tom. I would recommend him highly. I started getting training sessions with Tomasz last year. I felt I hit a dead end and fell out of love with training when I was training on my own. I needed some guidance and direction with health and physical performance. Tomasz’s knowledge with the body, different styles of training and diets got me back in the mood for training again. Even when I got injured he was able to treat me and give me advice on how to cure it. For this I can’t thank him enough. He became a really good friend and trainer. Recently we cycled from London to Poland. Tomasz does this once a year and asked me to join him this year. In my head I was thinking… “He must be crazy!” The more he talked about it I really got into the idea of doing something like this that would become a great achievement in my life. We did an intense 2.5 month training camp where he crafted a programme that would prepare me for this epic journey. Can’t thank him enough for giving me the drive and education for the training. We both conquered the 1000+ miles bike ride this July in 7.5 days where we set up a charity for my friend who was diagnosed with cancer recently. Without Tomasz no way was I able to complete this ride. Hopefully I will stay fit all year round now with the new knowledge Tomasz has given me. You never know… I might cycle around the world eventually! "Your journey is your destination."